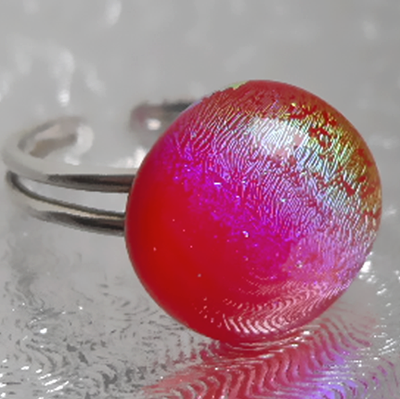 Sterling Silver fitting on round Red/Purple/Green/Gold Dichroic glass ring . The glass piece is 1.7cm in diameter and is made of two layers of glass. A Red layer topped with a layer of clear rainbow patterned Dichroic glass. The fitting is Sterling Silver and is expandable to fit most fingers. It comes in a Silver card gift box.